Hi friends! 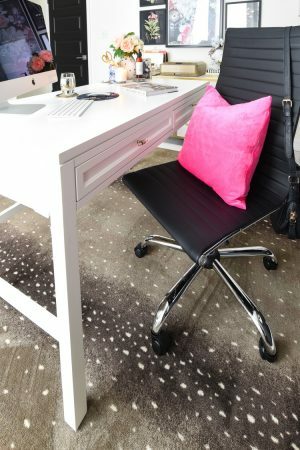 Thrilled to be here with a Dollar Store DIY with my fellow black and white obsessed bloggy friend Rachael from This Is Our Bliss. 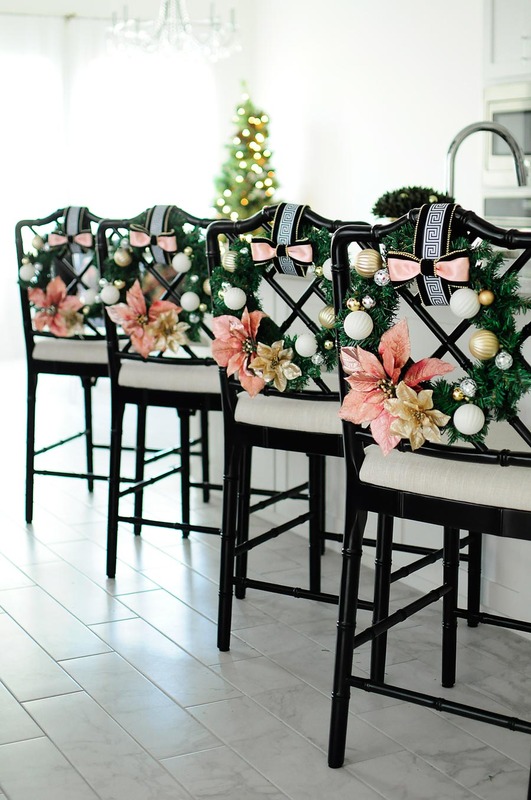 A few weeks ago I showed you all a DIY chair/barstool blush pink ornament wreath that was made primarily with Dollar Tree (dollar store) items. 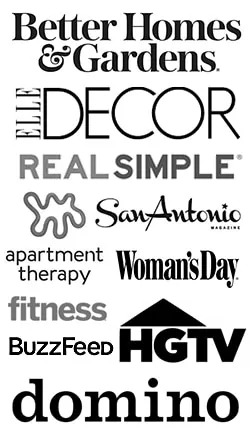 It’s been a huge success on Pinterest, so thank you all for sharing my projects! 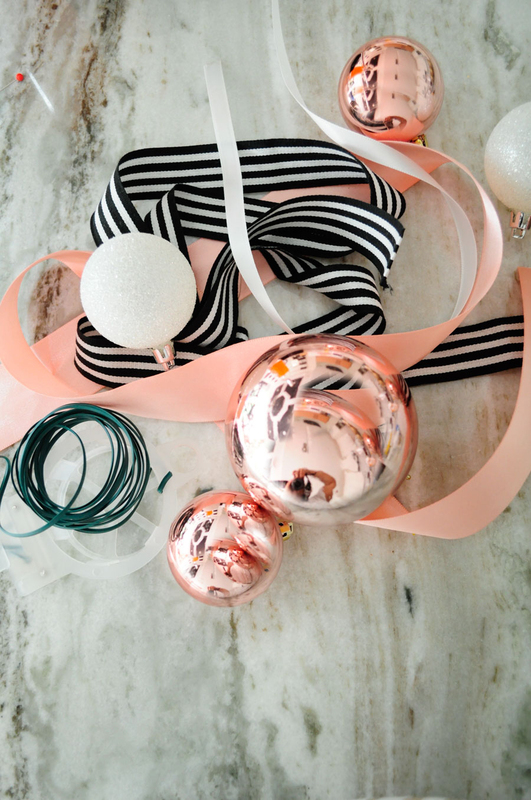 Today I’m here with some SUPER SIMPLE decor ideas using leftover ornaments. Truth be told, I NEVER EVER put back the spare ornaments that don’t make it onto my tree. Ever. I use them to add holiday cheer in various spots around my home. Like on the bar cart in 2015. Or an apothecary jar in 2014. 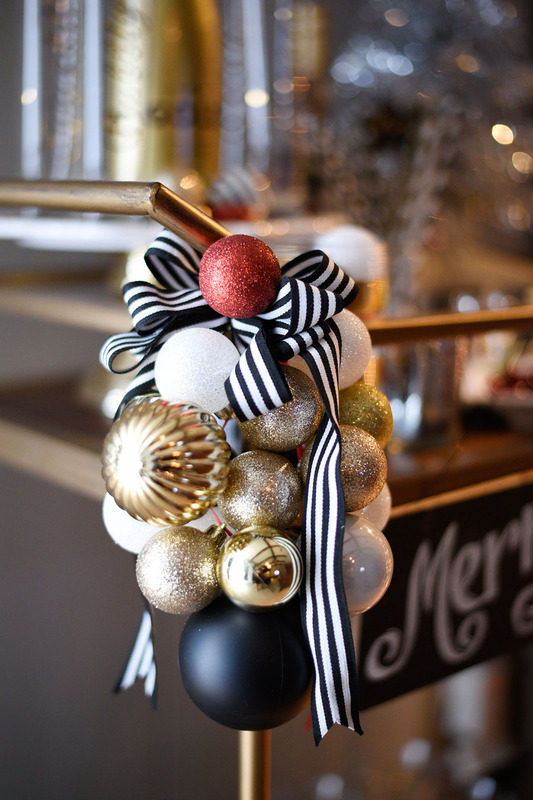 I get a lot of questions about the ornament cluster on the bar cart and it is sooooo easy. Ornament clusters are a way to use up lots of ornaments and add festive cheer to various spots in your home. I like to use one large ornament for the “center” and then use smaller ornaments for the rest. I find odd numbers make for the best clusters. You can mix and match colors, sizes, textures- go wild! So, gather your ornaments, a thin twine, ribbon or fishing wire, some accent ribbon (optional) and let’s do this. I cut my twine about 24″ long- eyeball it. No need for fancy measuring. I string my center/largest ornament onto the string and center it. Then I add in the rest of my ornaments on the left and right sides. Pull the string ends together, tie a simple knot, and you are done. 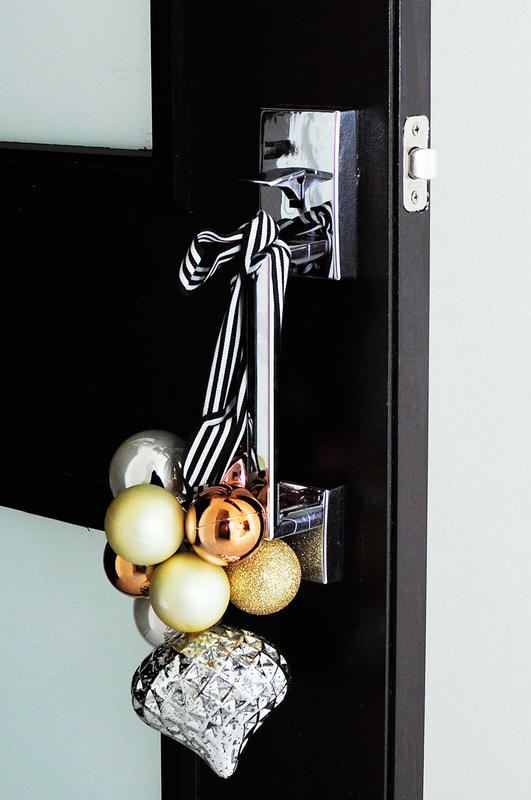 I added a striped black and white ribbon to a cluster and hung it on my front door for some holiday cheer. You can make these as large or small as you want. I keep mine on the smaller side since I use them as little accents on baskets, doors, bar carts, or anywhere that something can easily “hang”. So easy! You could even use mini ornaments to cluster together 3-5 ornaments and use as gift wrap accents or party favors. 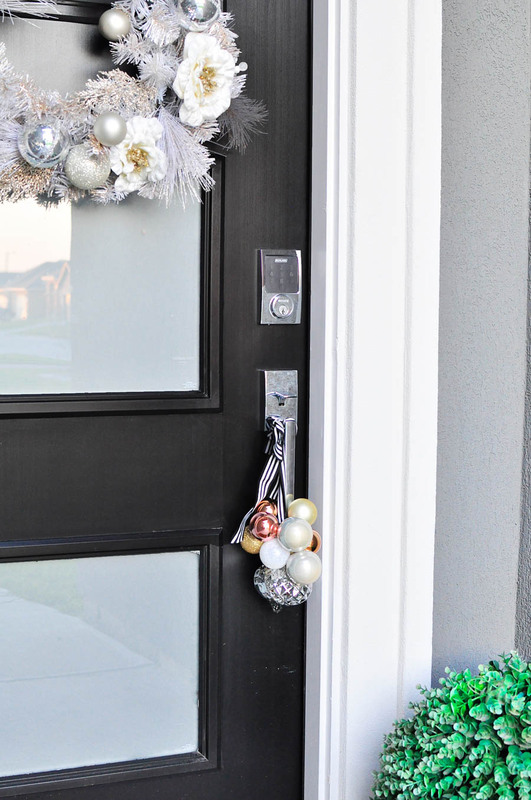 This is a kid friendly project (use shatterproof ornaments! 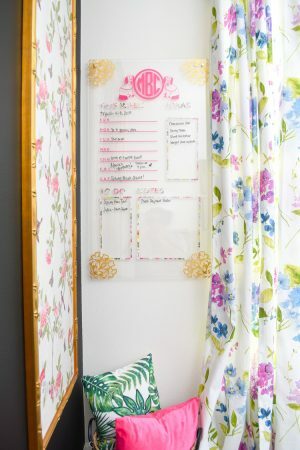 ), so you could easily do this with the kiddos and let them choose their own colors to add a festive touch to their bedroom doors or headboards. 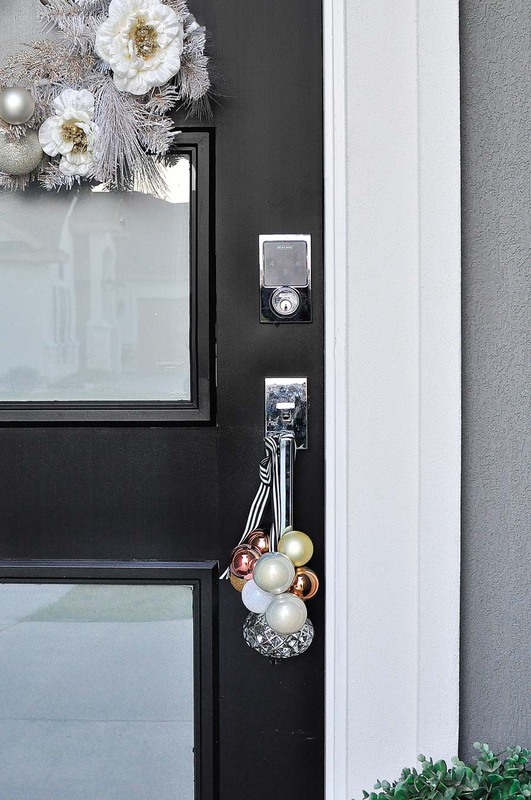 Hope this gets you inspired to put those spare ornaments to use as some extra holiday decor! 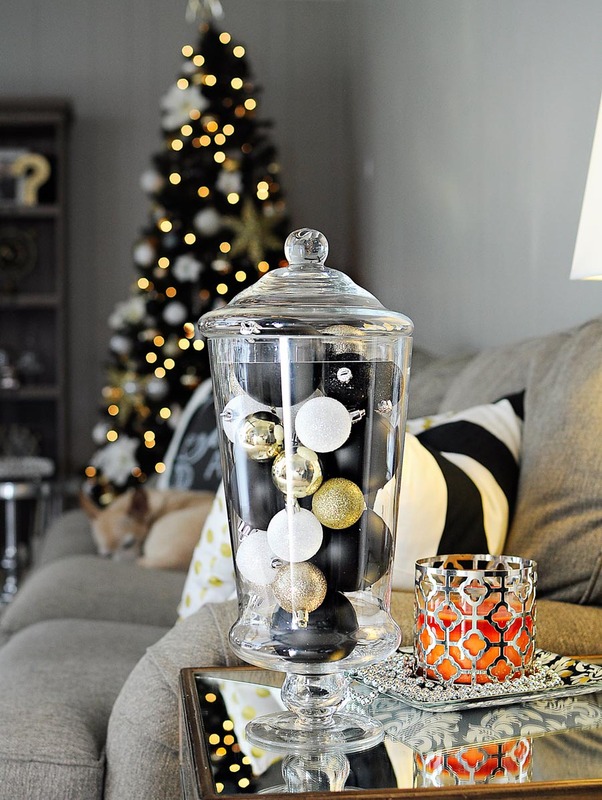 Check out these other festive dollar store holiday DIY ideas from my fave bloggers below. I’ll be back on Monday to kick off my holiday tours, but I may squeeze in a post over the weekend to show off my NEW SOFA. I finally chose one you guys, CAN YOU BELIEVE IT? 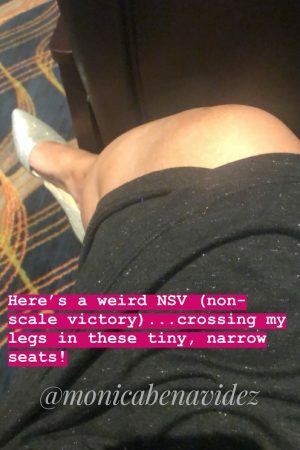 If you want to sneak a peek, head to my Instagram. Smooches, friends! I need, need, need to make some of these for my house! I always have extra ornaments and also use the extras around the home but I haven't known how to make one of these yet.